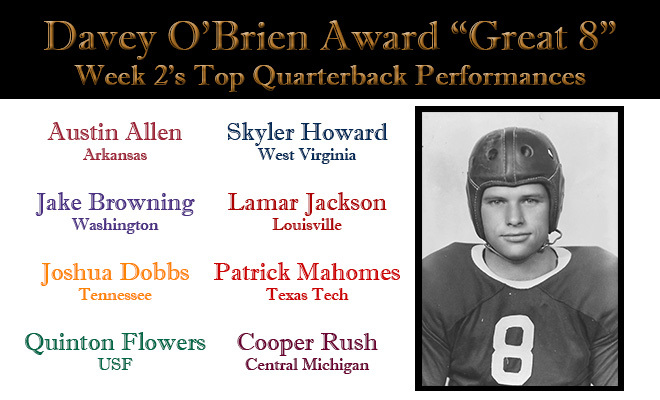 FORT WORTH, Texas (Sept. 12, 2016) – Improbable finishes and record-setting numbers highlighted the quarterback performances worthy of the Davey O’Brien Award’s “Great 8” honors for week two of the college football season. 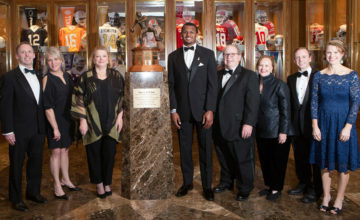 The eight honorees, as determined by voting from the award’s selection subcommittee, include: Austin Allen of Arkansas, Washington’s Jake Browning, Joshua Dobbs of Tennessee, USF’s Quinton Flowers, Skyler Howard of West Virginia, Louisville’s Lamar Jackson, Patrick Mahomes of Texas Tech and Central Michigan’s Cooper Rush. 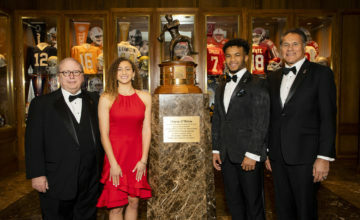 Six of the players­ – Browning, Dobbs, Flowers, Howard, Mahomes and Rush – were named to the Davey O’Brien National Quarterback Award’s watch list prior to the season. Meanwhile, Jackson is the lone player to appear on the first two “Great 8” lists of the season. Austin Allen, Arkansas, Jr., 6-1, 209, Fayetteville, Ark. Led Arkansas to a heart-stopping upset at No. 15 TCU by going 17-for-29 for 223 yards and three TDs, and rushing for the game-winning score in double overtime. 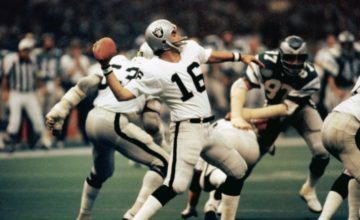 Tied the school’s single-game record with five touchdown passes, while throwing just five incompletions (23-for-28, 294 yards), in a 59-14 win over Idaho. Tallied five touchdowns in a 45-24 win over Virginia Tech, throwing for three TDs and rushing 14 times for 106 yards (21st 100-yard rushing game) and two scores. Quinton Flowers, USF, Jr. 6-0, 210, Miami, Fla.
Posted career-high numbers in passing yards (350), passing touchdowns (4) and total offense (403) in the Bulls’ 48-17 win over Northern Illinois. Collected five touchdown passes, going 20 of 33 overall for 389 yards, and had eight carries for 50 yards in a 38-21 victory over Youngstown State. Became first FBS player ever to pass for 400-plus yards (411, 1 TD) and rush for more than 175 (199, 4 TDs); set ACC record with 610 total yards versus Syracuse. Finished 38-of-53 passing for 540 yards and five touchdowns, and added 11 carries for 44 yards and a score, in a 68-55 defeat at Arizona State. Cooper Rush, Central Michigan, Sr., 6-3, 230, Charlotte, Mich. Defeated No. 22 Oklahoma State with a game-winning, 51-yard Hail Mary with no time on the clock, and finished the day 30 of 42 for 361 yards and four scores.